Last week the personal finance website SmartAsset released an analysis on the best-paying geographical areas for STEM jobs. STEM, in case you haven't been paying attention, stands for Science, Technology, Engineering and Martial Arts. Ha, just kidding, man. Math! Using the latest Bureau of Labor Statistics data, from 2014, SmartAsset crunched the numbers for 53 U.S. metro areas that have at least 30,000 workers in the sciences, computers, mathematics, architecture and engineering. Comparing each area's average pay and increase in average pay to the corresponding national average, they came up with their list. "In short, our analysis looks at the metro areas that are the furthest above the national median for both STEM pay and income growth," SmartAsset wrote. As you can see, and as you may have suspected, paywise it's California-here-we-come for STEM workers, with three of the top five regions, including Silicon Valley, located in and around the San Francisco Bay Area. But wait, there's more. This post by WalletHub in January ranked the best and worst areas for STEM professionals inclusive of not just pay, but quality of life and professional factors like job openings, R&D budgets, and transit and housing. But wait, there's more of the more. 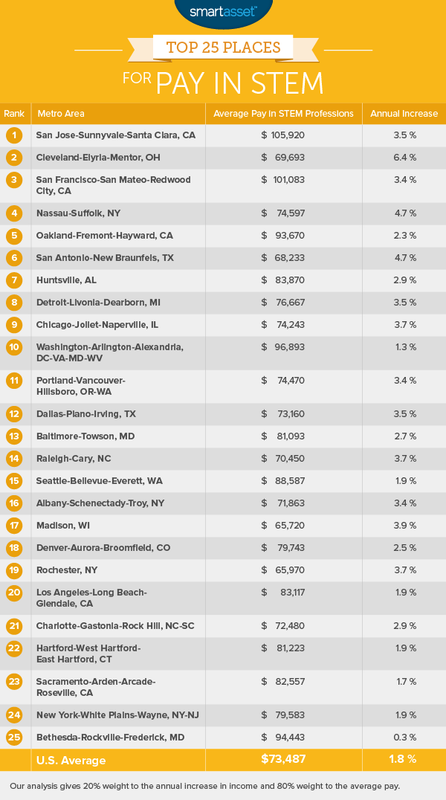 Finally, we have Best Places for STEM Graduates, posted last year by NerdWallet. While NerdWallet may or may not have the most incisive equation for tabulating STEMie heaven, they at least sport the best name for this type of website. In ranking 330 metro areas, the Nerds took into account the number of STEM employees per 1,000 jobs, annual average wage, median monthly rent and unemployment rate. That formula produced a sleeper of a No. 1 -- Huntsville, Alabama. "A STEM worker in Huntsville, Alabama will pay about 9% of his or her income on rent, compared with a peer in [No. 2] San Jose, California, who can expect housing to claim at least 17% of his or her salary," NerdWallet wrote. Here are all the jobs that BLS categorizes as STEM. 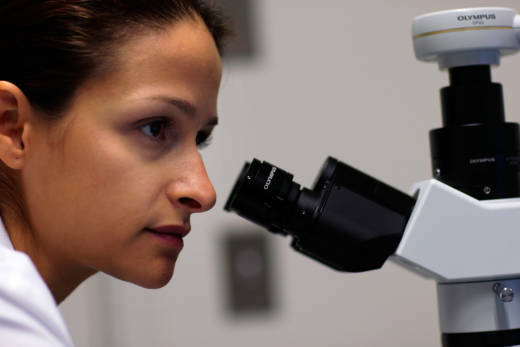 While medical scientists are on the list, doctors and other health care professionals are not. But something to take note of: While it's true that we are living in the digital age, the biggest job growth in terms of sheer numbers from 2014-24 will not occur among computer programmers or big data analysts, according to BLS, but rather personal care and home health aides. So welcome to the aging baby boomer economy. You can check out median salaries for dozens of other health care occupations here--click on the individual links to find job growth projections for each. One of the interesting things WalletHub did was to ask a panel of academics in STEM education questions related to the STEM job market. One query: Why do so many STEM graduates end up not working in STEM occupations, as reported by the U.S. Census Bureau in 2014. That appears to be due at least in part to the exclusion of many otherwise related professions from the government's list of STEM jobs. Peter R. Turner, director of the Institute for STEM Education at Clarkson University, told WalletHub "most STEM graduates do work in STEM fields but often in areas where they are using those skills for other applications." That was echoed by several of the other experts. But not Carolyn Parker, assistant professor of STEM education at Johns Hopkins University. She said: "We have an unwelcoming STEM culture, which supports a lack of interest in STEM courses and careers, particularly among females, people of color, and people with disabilities, because of entrenched cultural attitudes and beliefs about innate abilities." The Census Bureau wrote back in 2014 that "men continue to be overrepresented in STEM, especially in computer and engineering occupations. About 86 percent of engineers and 74 percent of computer professionals are men." Click on the link for the government's career outlooks for STEM jobs, from quantum computer research scientist to sports statistical analyst. And next week, maybe we'll do Best Areas for Journalists, where every region comes in last.